Thu., Dec. 22, 2016, 9:14 a.m.
Spokane photographer Rika Ream traveled to Palouse Falls State Park near Washtucna during last weekend’s bitter cold weather to marvel at the ice around the 185-foot Palouse River waterfall. The jaw-dropping white scene was mesmerizing, and a pair of daring ice climbers dropped her jaw even farther. A photograph she captured of the climb has frozen the attention of a few Washington State Parks officials, too. The image she posted on Sunday on Facebook shows Jess Roskelley of Spokane climbing up the vertical wall of fragile ice in the frosty mist of the main waterfall. Scott Coldiron is belaying from below. State Parks officials saw the photo as it was reposted on The Spokesman-Review’s Outdoors Blog. “I am concerned that posting the photograph of the ice climbers will be perceived as an encouragement of that type of recreation at Palouse Falls State Park,” said Audra Sims, manager for the seven southeastern state parks in the Blue Mountains Area. Roskelley, a pro climber who has challenged ice on Mount Everest as well as in Alaska, Canada and South America, was not particularly alarmed by the state parks sign his group passed as they hiked the precarious unofficial trail to the base of the falls. This is pretty much the scenario wherever he plies his craft, Roskelley said. Visitors unskilled in climbing occasionally “have overestimated their ability and underestimated the resource,” she said. Inviting public visitation while managing public safety and protecting the resources is a delicate balance that state and national parks alike try to achieve, she said. Concern for visitor safety in the rugged park with its vertical walls, crumbling rock, slippery boulders and treacherous falls-basin currents has grown in recent years along with the increase in visitation – and injury accidents. “What was once a quiet park has become a lot more popular, especially since Palouse Falls was officially named the state waterfall in 2013,” said Virginia Painter, State Parks spokeswoman in Olympia. “In 2012, the park had 85,000 annual visits. That number grew to 121,000 in 2015 and 172,600 in 2015. Until a few years ago, major accidents were fairly rare at the park, which is served by volunteer emergency crews from very small area towns, such as Kahlotus, population 190. Responding to emergencies hits these fire districts hard in terms of time and funding, she said. Other visitors were already down by the water when he and Coldiron arrived, and the others weren’t similarly equipped with crampons, ropes and other ice climbing gear. His father, John Roskelley, a former Spokane County Commissioner who was considered America’s premier mountaineer in the 1980s, said he could understand the park manager’s safety concerns. “It’s a fact of life that the tools, boots, crampons and other gear has gotten very good and even regular climbers can buy that equipment and get themselves into trouble,” he said. “We were careful,” Jess Roskelley said. “My assessment after checking it out is that you’d have to be a real idiot to get down there to try to climb that spray ice. “Protection is tough to place. The ice formed by the mist from the falls is brittle, crumbly and poorly adhered to the rock. 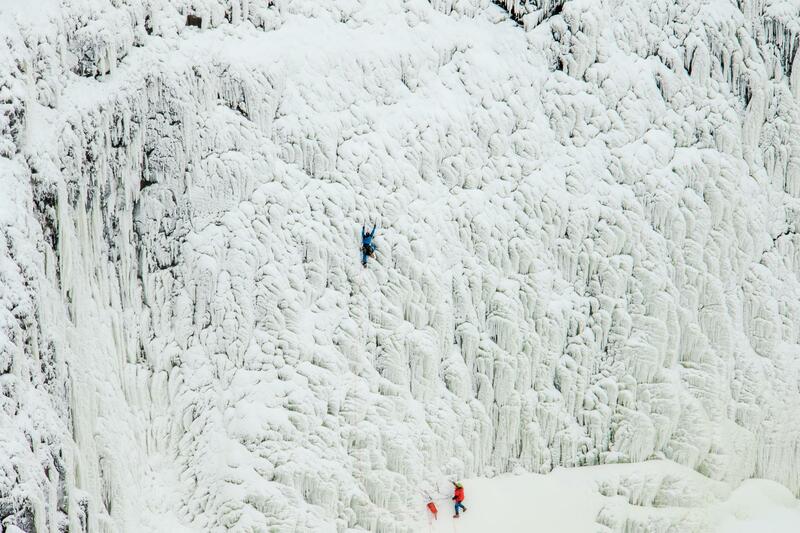 The weather window for climbing ice along the vertical walls along Palouse Falls may be only a few days a year and may not even exist every year, he said. Roskelley said he climbed one pitch of about 155 feet before descending. Published: Dec. 22, 2016, 9:14 a.m.